AC3RF is a recurring topic for questions on the forum, often from new LD users who have a DVD/BD background and have a hard time thinking in terms of pre-digital devices. I hope this little AC3RF FAQ will clear most of the questions, it's an update to an eBay guide I wrote about 10 years ago. So you got yourself a recent LD player with an AC3RF output or you are planning to get one? You might be wondering what is needed to process it correctly... or more simply what could be different from the Dolby Digital soundtracks found on DVDs or BDs? So... you might rightfully ask Will LD soundtracks sound weaker, less defined than their DVD counterpart? Normally they should but the fact is that they don't sound weaker, they actually often tend to sound better, especially when compared with early DVDs releases. How is that possible? The audio mastering was made for a purely 5.1 system (full 5 speakers + dedicated subwoofer). 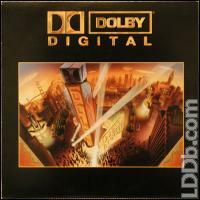 If you had only a standard stereo or surround system, then the Digital Tracks (standard Dolby Surround) were available. 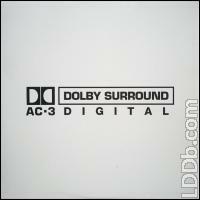 In the meantime, DVD had only one AC3 soundtrack that was supposed to sound as good as possible on any system, from a simple stereo TV set to a full-blown THX-certified system. Compromises were made on dynamics and frequency ranges to make sure your Death Star final explosion in Star Wars does not make "plop" on your speakers. All in all, there are potentially better AC3 soundtracks on LD. As of early 2018, the database lists 1,150 AC3 titles. This includes multiple AC3 releases of the same title in different countries or Pan&Scan vs Letterbox version, single vs Boxset, etc. They are physically stored on the right analog track of NTSC LDs. They are digital information stored with modulation -- just like Internet (digital) used to be accessed over (analog) phone lines in the 90's via MOdulation/DEModulation (MODEM) devices. The analogy (pun intended) still works for LDs because to enjoy their AC3 soundtrack you will need a demodulator able to transform this analog signal into a digital bitstream that your A/V amp can understand. If not 1. or 2. then you must purchase an additional piece of equipment called an "AC3RF Demodulator"
Laserdisc Analog Right Channel → AC3RF output → Coax cable to A/V Amp → A/V Amp AC3RF input → 5.1 soundtrack decoded! Toslink cable to A/V Amp → A/V Amp Digital input → 5.1 soundtrack decoded! Other manufacturers (JBL, Nakamichi, B&K, etc.) were simply OEM version of Pioneer or Yamaha designs. Other gears are a little more elaborate and will accept both digital signal (toslink/coax) as well as AC3RF in and will either "pass-through" the digital information or automatically switch to AC3RF demodulation if the signal is detected. 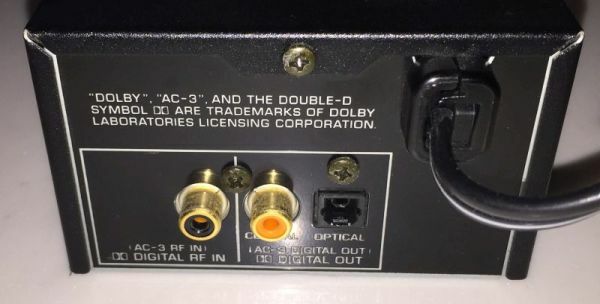 This way, in case you own a dual LD/DVD player, only 2 connections from the player to the demodulator will provide a single output to your A/V amp. Very convenient to avoid creating 2 different profiles or switching cables manually when you swap between LD and DVD. It also works on normal LD player with AC3RF and Digital outputs, only taking one port on your A/V amp. Because the technical specifications of Dolby Surround EX were not finalized when the first few EX LDs were released, your A/V Amp will not detect a 6.1 soundtrack but only 5.1. This is normal because the information flag that tells your system it actually is a Surround EX encoded soundtrack is missing. You will have to manually force the 6.1 mode to take full advantage of it.